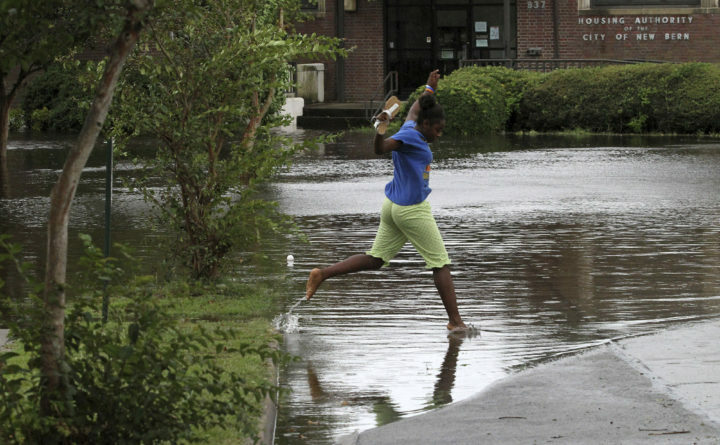 A child jumps a flooded street at Trent Court Apartments as surge water from the Trent River overflows sections of the neighborhood in New Bern, N.C. Thursday, Sept. 13, 2018. Emergency workers went door to door urging people to flee Florence’s rising waters Saturday and rescuers used inflatable boats to pluck others from homes already submerged as the storm poured on the rain, setting the stage for what could be some of the most disastrous flooding in North Carolina history. Officials in North Carolina’s Harnett County, about 90 miles inland, urged residents of about 1,100 homes to evacuate because the Lower Little River was rising toward record levels. A pet dog licked Johan Mackie’s face after he helped rescue Kevin Knox’s family from their flooded brick home. The Army sergeant was part of a team using a phone app to locate people in distress. At 11 a.m., Florence was centered about 40 miles west of Myrtle Beach, South Carolina, moving west at 2 mph, not even as fast as a person can walk. Its winds were down to 45 mph. “And we’re not done yet,” Graham said, adding that some hard-hit areas could get an additional 15 to 20 inches because the storm was moving so slowly.